If you have been up to date with recent technology, you’d know about HTML5, and how Flash has many problems such as security and stability. 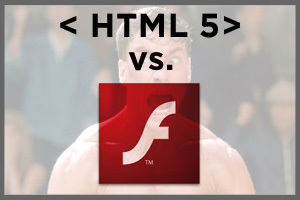 Though, HTML5 isn’t officially out yet, it has many thing over Flash, but also some things Flash is actually better with. Flash was released in 1996 and still has many problems to this day. Whereas HTML5 hasn’t and won’t officially be out until at least 2022, but still it has better performance in most respects compared to Flash, but didn’t beat Flash in every category. Though, the tests weren’t exactly scientific, but still accurate for the most part. The tests showed that HTML5 performed much better then Flash in Safari for the Mac. But, for all you who don’t like Safari for the Mac, the data shows that HTML5 wasn’t as good on Google Chrome or Firefox. Sadly though, Flash 10.0 was more efficient than HTML5 in Chrome For Windows based machines. I think that HTML5 will be great, but i truly hope that Flash Player gets improved for those that have to use it. But, after about 13 years, i might have lost hope in that happening. But, who knows. Look at Windows Vista for example, it was horrible (at least until SP2). Then Windows 7 came out, and now it’s ranked in the 4 out of ZDNet’s Top 10 Operating systems in February. Complete data for the comparison with HTML5 and Flash can be found here Comparison data here. Previous articleCould Google Chrome netbooks cost more than Windows netbooks?